Hello from Innsbruck. It is the end of October and we are somewhere in between Fall and in winter from the looks of it. 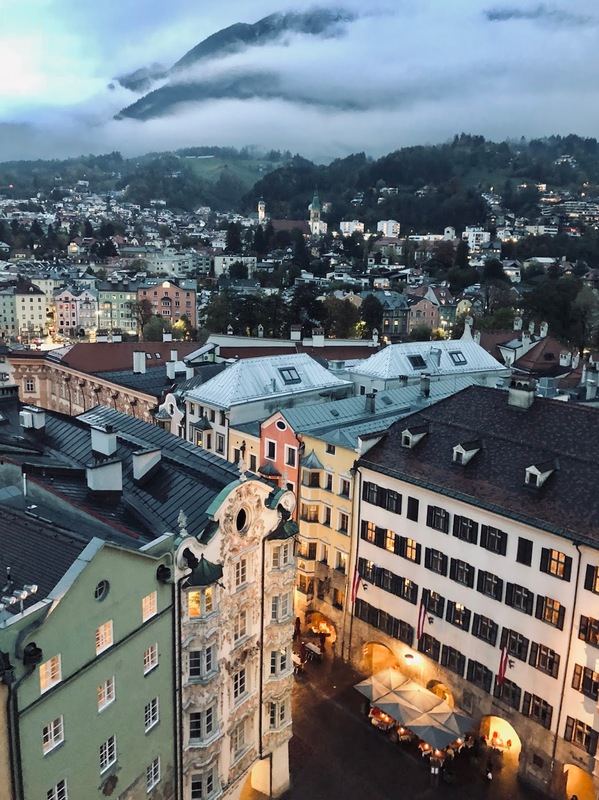 Aski is in Hong Kong and I decided to book a 3 day trip to Innsbruck, Austria. 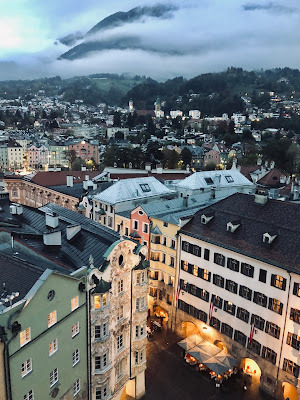 I actually did not know much about Innsbruck but I was quick to buy my plane ticket after seeing just one photo of this gorgeous city surrounded by Mountains. I got my flight from London Gatwick Airport. It cost me £90 for a return flight. Trust me, I could have booked a cheaper deal BUT it is still a great deal because a week later, I checked the flight for one of my girlfriends and the flights were £200+. 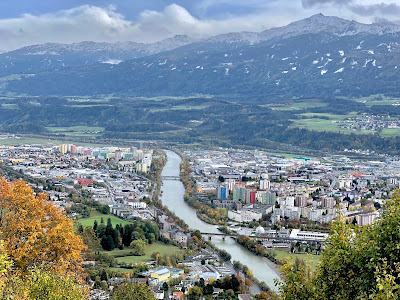 Moving on, got to Innsbruck at 2pm and the central city is not too far away from the airport. There is literally a 12 minute bus from the Airport to the city. I got to my hotel, Adlers Hotel in Innsbruck. It is located very well and so I quickly checked in, left my stuff in the room and ran out to explore the city. I wanted to keep it super chill for the first day and so I started with a walk around the city. The Golden Roof was just 10 minutes walk from my hotel so first I walked towards it. The entire street was buzzing and I instantly noticed the golden roof but also the beautiful mountains everywhere I looked. 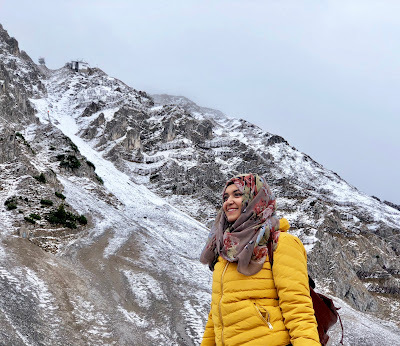 Some moments on the first day, the mountains were hidden in clouds but I prayed that the clouds go away by the end of my trip so that I can enjoy the beautiful view of the mountains while walking in the streets of Innsbruck. First day was wonderful yet I did not wanted to do a lot and wanted to just walk around to get myself familiar with the city. Day 2 and Day 3 were super exciting and action packed! I started my day with heading up to the 12thfloor of the hotel for some breakfast. The view from there was so breath taking, I cannot describe in words so let me show you. I later headed out and started walking towards the cable car station for a trip to the mountains, Nordkette, which were only 20 minutes away. As I had my 48 hour Innsbruck card with me, the cable card was included which otherwise would be 40 euros. Moving on, as you can imagine that the views were simply incredible and there was some snow as well on the mountains so I got to see even a touch of Winter as well. 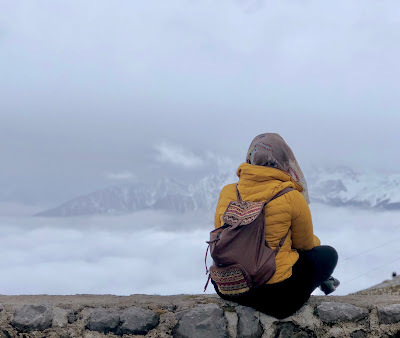 Today, it was a little cloudy so I couldn’t see the city of Innsbruck from the top but the mountains were easily visible. I spent good 4 hours there just admiring the mountains and walking about. I came back down and decided to walk along the Inn river. One side I had beautiful Orange and Yellow trees showing off the colours of the season and on the other side I saw colourful buildings. What I found out about the story of the colours from locals was that each colour represented a certain profession back in the day. A Barber, a shoe maker, a butcher, a lawyer. Which is why all the colours of the houses are different. I had coffee at one of the cafes right across the Inn river where I had the view of the mountains and those colourful houses. 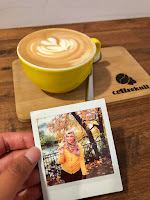 Coffee Kult is a great place for a relaxing stop combined with a cup of jo, oh and took a photo of the coffee with a Polaroid I took earlier! Here is mine. After a little coffee break, I bought some postcards because I simply love collecting them. 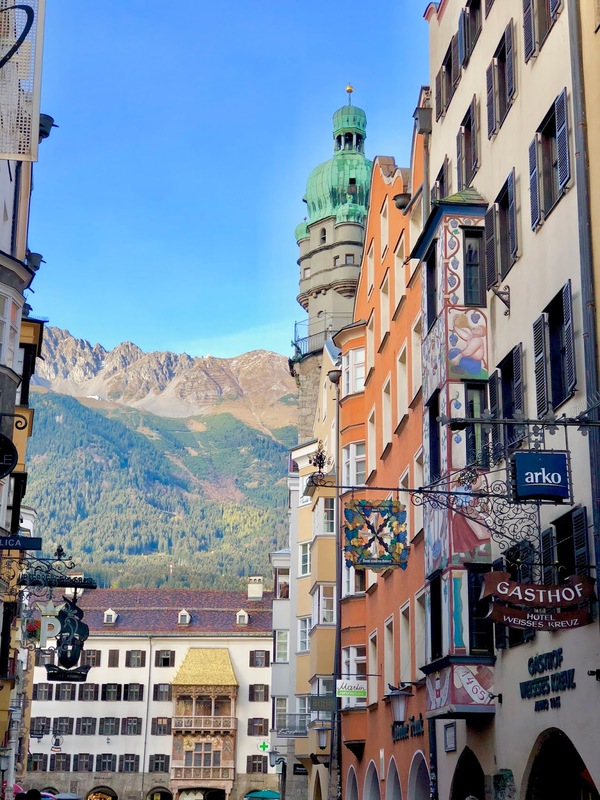 I then walked towards the buzzing Old town streets of Innsbruck and I came across the Golden Roof, well known as Golden Dachl. It marks the wedding of Emperor Maximilian I to Bianca Maria. 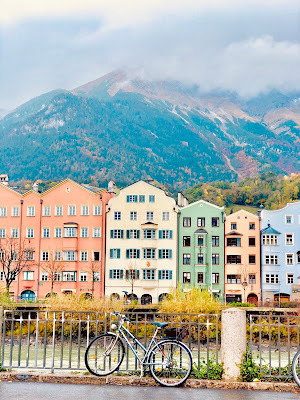 It is quite beautiful and is certainly one of the famous landmarks of Innsbruck. A few feet away from the Golden Dachl is the Stadtrum. Not too long stair away, on the top of the tower, you see the entire city of Innsbruck and I highly recommend you going there. That was pretty much the end of day 2 for me. 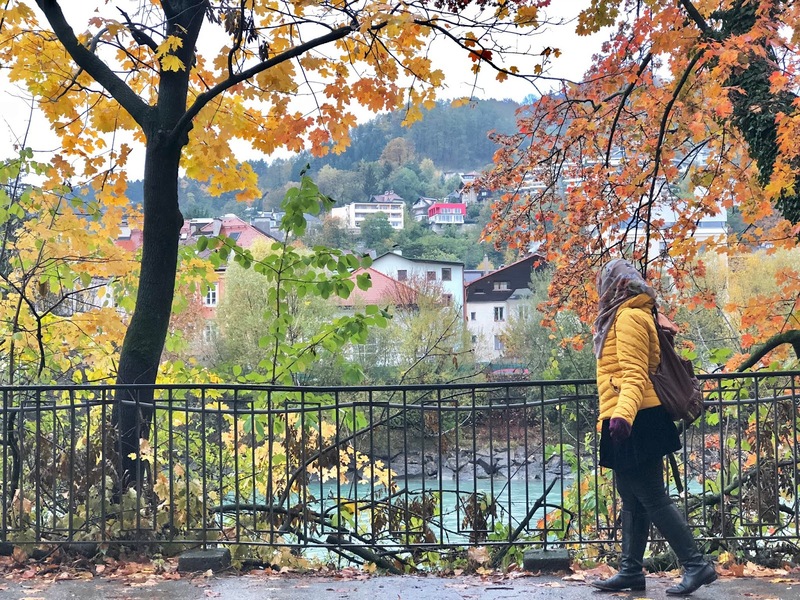 After that, I just walked to the super market in search of some Austrian snacks and if you follow us on Instagram and saw out stories, you would’ve seen that was an epic fail. Sadly the third and final day of my Innsbruck trip was here. I like waking up early and knowing that it was my last day here, I woke up extra early, got ready, packed my bag and was at the 12thfloor for some breakfast by 7. Even if you cannot implement this in your daily life, try to to do so on your travels. Have a big breakfast. My traveling style involves a lot of walking which is why I believe that having a big breakfast gives me plenty of energy to do on for the entire day. I left my bag at the hotel counter and was on my way to the train station which was 3 minutes walking from my hotel. 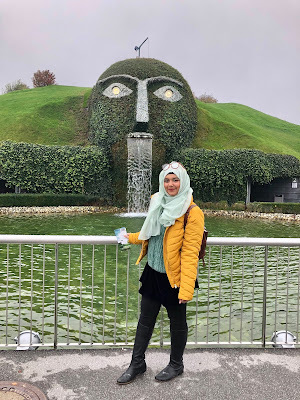 For today, I had one main agenda, visiting the Swarovski World in Wattens. A shuttle takes you directly to the Swarovski World. I got there right as they opened for the day and therefore, there weren’t many crowds. The waterfall right by the entrance is so beautiful that I had to take a photo of it. Upon entrance, the exhibitions were super easy to follow and some of the displays had my hearts. I mean, look at it, they are crystals. The Crystal Cloud features 800,000 hand-mounted crystals. There are four new Chambers of Wonder, designed by international artists using the famous Swarovski crystal.One of my favourite artists is Yayoi Kasuma and I came across her words in the museum as well.CHANDELIER OF GRIEF.The realm of the Giant hosts a rich collection of precious items housed in 17 Chambers of Wonder. There were many more beautiful pieces of art in the exhibit. I definitely would recommend a visit to Swarovski World, especially if you have more than 2 days in Innsbruck. Since I left in the first shuttle to the Museum, I finished early and was able to return to the city in time to visit the Nordketten once again. The day before when I visited, it was covered in Snow and it was beautiful but because of the clouds, I would not see the view of Innsbruck from the mountains. 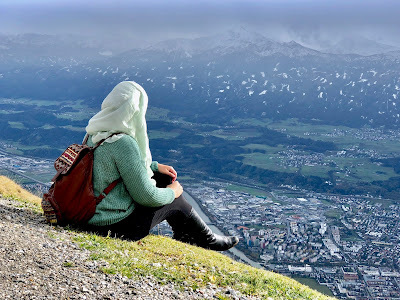 This time, the day was clear, the mountains had melted away the snow and I had a wonderful view of Innsbruck. 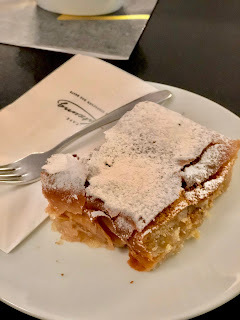 It was time for a final walk in the city but I could not leave without having some Strudel so for that, I headed to Café Konditorei Katzung. I only got a strudel and some water. This café is located right by the Golden Roof so I actually had the view of the main street. The strudel was so delicious and I couldn’t have thought of a better way to end my trip. I walked to my hotel to pick up my bags, walked to the bus stop which was 3 minute walk and I was off to the airport. Innsbruck was incredible in every way! I didn’t know much about it before I visited. Even when I thought about visiting Austria, I always thought about Vienna or skiing in the mountains, but Innsbruck was a wonderful surprise and I am so glad I booked a trip here. Much needed rest from the course and a perfect solo trip. -Buy Innsbruck Card. You will save a ton of Money on all the major and minor attractions around Innsbruck as many are Included in it. -Don’t miss the mountains. Do take the cable car up to the mountains. -Stop to have some Apple Strudel at one of the bakeries around town. I would like to thank Innsbruck Tourism for making this trip simply unforgettable. 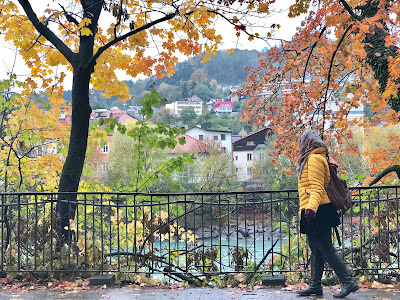 Anyone who plans on visiting Innsbruck should read further more about the city on their website and they can help you plan your trip according to your taste. 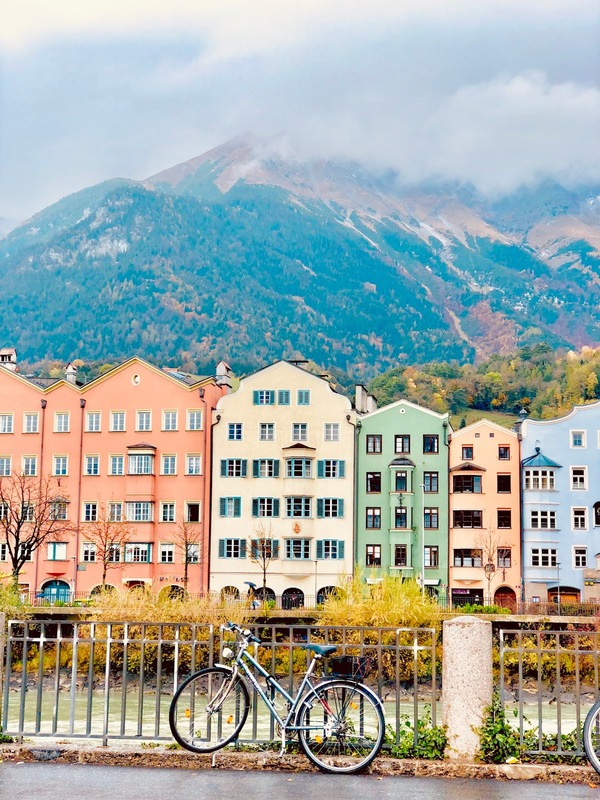 Innsbruck card is highly recommended, you save a lot of money. Breadth taking views taken, i hope you left Innsbruck but your heart would be still there.